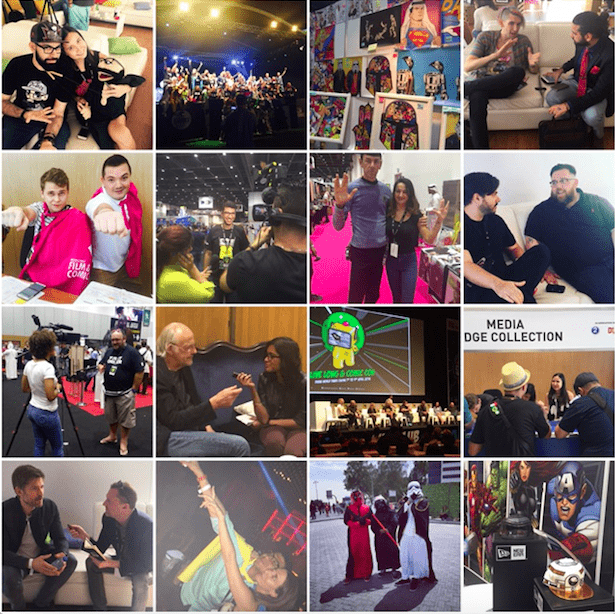 These are the voyages of Katch International; on its mission to promote the fabulous Middle East Film and Comic Con as they endeavour to bring the best entertainment to true believers from all over the world. As we sweep up the stray graphic novel doddles and pack up the virtual reality googles (thanks Samsung!) the time has come to reflect on another ‘out of this world’ edition of MEFCC! Now in its 5th year, the 2016 exhibition saw record numbers of visitors through the door. Over 60,000 fans travelled from far and wide, interstellar public transport notwithstanding, for 3 days of non-stop cosplay, fun, drama, comics, trading, shows, music, films and more celebrities than a Marvel Universe cross-over movie! Whether it is the line-up or the location, MEFCC has arguably the best fans in the world; not only did we see characters from all the major sci-fi and fantasy genres, as well as many of the more niche and underground, but MEFCC is truly a ‘meeting of minds’ in which attendees of every age, gender, culture and nationality come together to celebrate the power of imagination. As the strategic alignment PR agency for MEFCC, the Katch team were responsible for making sure that the voices of 2016’s bumper crop of celebrity stars connected with media, both regionally and internationally. Whether they wanted the inside scoop on season 6 from Game of Thrones star Nikolaj Coster-Waldau, RKO tips from Randy Orton, Josh Whedon gossip from Summer Glau, news on upcoming Three Cornetto projects from Nick Frost or simply to shake the hand of the time-travelling legend that is Christopher ‘Doc Brown’ Lloyd, no one left disappointed! Aside from some insightful one-on-one sessions with journalists from Dubai One, The National, Gulf News, Whats On, Sky News and many more, we hosted a full roster press conference including anime voice artist Veronica Taylor, ‘Tricky’ Darryl MCDaniels of Run DMC and MEFCC regular Max Landis! If that wasn’t enough, the Godfather of comics, Mr Stan Lee, also joined us live from LA for two Q&A sessions for true believers! Fantastical celebrity guests is one thing, but MEFCC also knows how to entertain visitors! • The Godfather of comics Stan Lee joined us live from LA via video link to answer those burning questions from a full house of fans. He let us in on a few secrets, including that one of his favourite cameos was in the Avengers movie and his most loveable character is Spiderman’s Aunt May. He also told us the character he would most like to meet is Tony Stark and that he believes no one else but Robert Downey Junior could have played the role. • MEFCC announced MEFCC announced that GAMES 16 will be held in September 22nd to 24th 2016 and ANIME will take place in Abu Dhabi in 27th to 29th of October 2016. • Die hard fans learned how to make your own Cosplay accessories from the world famous Alodia! • CEO of Starlight Entertainment Jeff Gomez sat down to critique the big screen adaptations of Shared Universes and let us know who is getting it right! • Creativity went wild in the Cosplay competition with entries from all over the world! The effort of two of the competitors paid off as they won a trip to Japan! The best female was Isabelle as a character from Starcraft and the best male David Woodhouse came as Warlord. • Max Landis delighted fans with a Q&A but was crushed by Veronica Taylor at the #geekquiz! • The winners of the raffle competition was announced today at the main stage, where a lucky winner was able to get their hands on a VIP trip to Los Angeles for two to walk the red carpet alongside Stan Lee at the premiere of Captain America: Civil War! • Fans got to witness the RKO of Randy Orton and he was on hand to give tips for budding wrestlers • Stan Lee, the godfather of Comic Books, made another special appearance via an online live Q&A session in the IMAX theatre, giving the true diehard fans a chance to speak to the man himself. • The Dubai Celebrity Gifting Lounge gifting MEFCC celebrities and Dubai socialites with orginal prints from Drawdeck and ecclectic printed Kimonos wraps and capes from Ayaso Boutique .